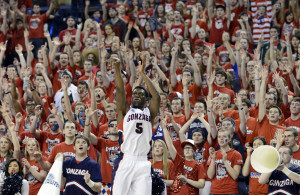 While I was hooting way through another Zags basketball win a few weeks ago, Gonzaga called. Alas, it wasn’t for me. It was my wife’s alma mater, making a saavy mid-game fundraising pitch. Basketball has been very very good to Gonzaga. Enrollment jumped by 65 percent after six good runs in the NCAA Tournament, based on what is know as “the Flutie factor.” Admission inquiries more than doubled, raising the academic bar for incoming freshmen. The Zag’s student section gives it up for Gary Bell, Jr.
And the Zags built a beautiful $25 million basketball palace, the McCarthy Athletic Center, with donations. I just wish Seattle had a good Zags bar to watch this year’s tournament. Know of one? Let me know, and I’ll buy you a beer there next week.